About five inches long. Dark cinnamon-brown upper, gray-white undersides, darker wings and tail. Central tail feathers barred. Thin white streak from the beak, over the eye, to the back of the head. Typical hunkered down wren stance with upright tail when alerted. Barred tail with white edges a little longer than the House Wren. Lives in forest edges, groves, farms and towns from southwestern British Columbia to southern California, Nevada and Mexico, east to Texas, Oklahoma and Missouri, and less densely populated through most of Tennessee and Kentucky, south to Florida and as far north as Pennsylvania. Forages through trees, underbrush, thickets and rock piles for insects, spiders and seeds. Builds nests of almost any material, twigs, grass, leaves, paper, moss, strips of bark and other hairy materials usually very low in natural or abandoned tree cavities, brush heaps, under bushes and very often in open sheds and bird houses. Lays around five to six, more or less, speckled pinkish or white eggs which hatch after about two weeks incubation and young leave the nest in about another two weeks. 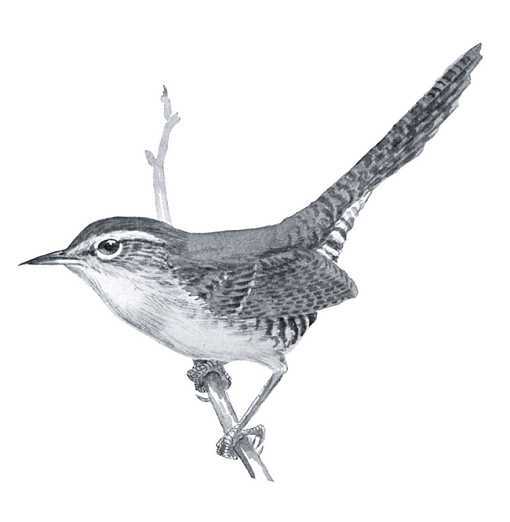 The Bewick’s Wren Birdhouse (same as for house wrens, winter wrens and brown creepers) has a 4″ by 4″ floor, 8″ inside ceiling, 1 1/4″ diameter entrance hole located 6″ above the floor and ventilation openings. Assemble with screws fit to pre-drilled pilot holes and secure hinged roof with shutter hooks. Mount or hang from a tree branch or under an eave or mount on a fence or on a wall from four (in more secluded spots) to out of reach if necessary with partial sun and shade. 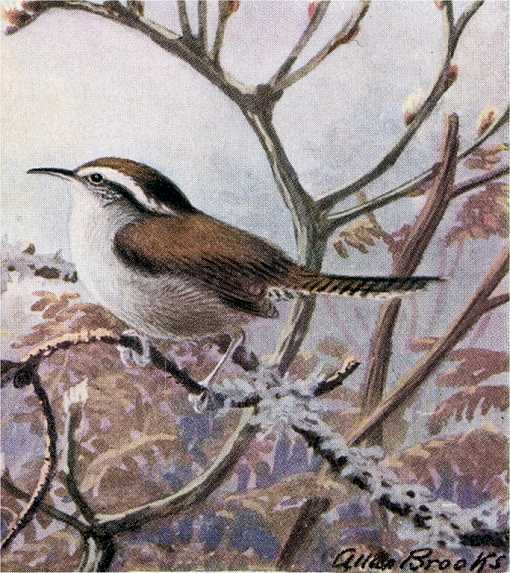 Because male wrens tend to build several nests for the female to choose from, hanging several nest boxes may make an area more attractive. Chickadees, Titmice, Nuthatches, Downy Woodpeckers and other wrens may use this box.